**Our most recent newsletter was a glaring reminder of how difficult these markets have become in terms of speculation. After several months of what we felt were solid projections provided by the DeCarley Perspective, our predictions fell a little cold the last time around. Unfortunately, this is the reality of trading (without the help of a crystal ball). Things change quickly, as the month progresses feel free to ask us if any of our outlooks have been revised to ensure that you are trading with timely guidance. The equity markets have staged a recovery in recent months that many thought to be impossible. In fact, the most recent two months of trading has witnessed record-breaking gains. In our last newsletter, we are among the disbelievers in the rally but the market has since proven to be much more resilient than originally thought. We were anticipating that the rally would run out of steam in the mid 830's, and we weren't far off the mark. However, we over estimated the size of the subsequent correction (we thought that a retest of the March low's were possible) and underestimated the pace at which the bulls could bring the market back to life. It seems as though the same group of people that are being blamed for bringing the markets to such depths, short sellers, may also be the explanation of the sharp rally. After all, the reversal began as short traders began tightening stops that were eventually elected and then the subsequent squeeze of the remaining bears. Until now, short sellers had no reason to fear the equity markets or to adjust their trading strategy. Being short had been lucrative for several months and they had no incentive to change. However, the v-bottom occurring in March may have been what the market needed to deter aggressive selling...or at least that is what has been the case up until now. Directional signals are highly mixed. 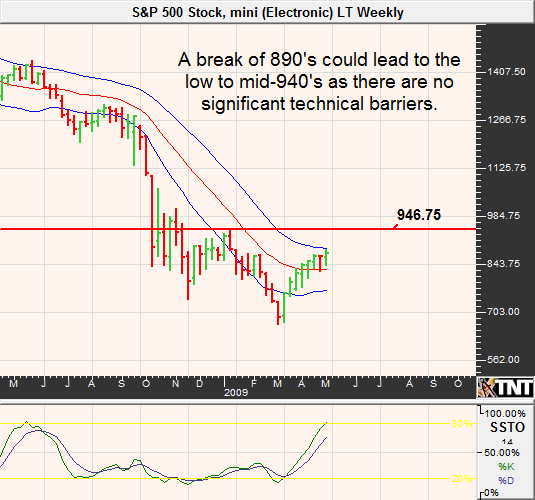 A daily chart suggests that continued digestion is necessary but weekly chart projections are pointing toward 940 in the S&P. Also pointing toward a continuation of a recovery is the fact that stocks absorbed the threat of swine flu with a certain amount of grace. A relatively mild overnight pullback is the extent of panic that the potential pandemic has created. From a seasonal standpoint, May marks the beginning of the "worst 6 months of the year". You have likely heard the mantra, "sell in May and go away"...A $10,000 investment compounded to $531,444 for November through April in the previous 58 years compared to $1021 for May through October. Therefore, while we think that 940 is possible it is hard to be overly bullish and we will likely become highly bearish at or near such levels. 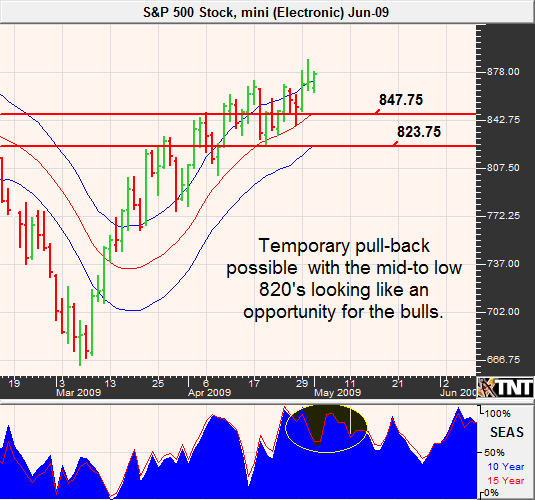 Based on the tendency for a moderate pullback in early May, it seems as though traders may see a near-term correction that could prove to be a valuable opportunity for the bulls and an eventual test of the 940's in the S&P. At this time, we do not foresee a move above this level. Nonetheless, traders in this market are carrying a short-term approach and market dynamics can change quickly. Stay tuned to the Stock Index Report for day-to-day projections. The Fed's promise to buy longer-dated Treasuries in an attempt to manipulate market interest rates has fallen short of expectations. The central government has pledged up to $300 billion for such purchases and has thus far only expended $77 million. The fact that the Fed's bark was louder than its bite has eased much of the tension in the marketplace and has allowed Treasuries to trade consistently lower. In writing last month's newsletter we were predicting a much larger role by the Fed, thus we completely overestimated the ability of the market to make gains despite weak seasonal tendencies. We will chalk this one up to another learning experience; bond and note seasonalities are difficult to explain but are undeniably accurate more often than not... it doesn't pay to go against them, even if the Fed is interfering with market prices. In our defense, we did say that if we were wrong, look for the note to retrace to 121'20 and that has become a reality. We are looking for continued weakness in Treasuries as a result of overwhelming supplies (government and corporate issuance of new debt) as well as less than horrific economic data. 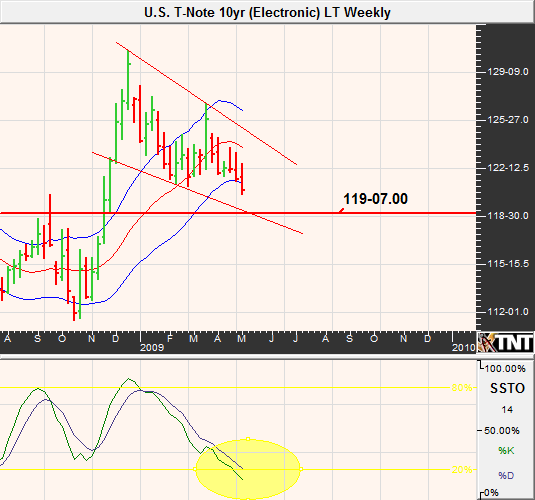 However, we don't believe that the selling pressure will persist below the 119's in the 10-year note. 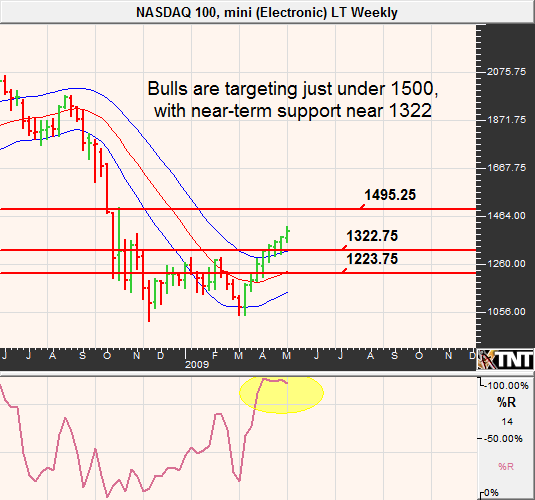 In fact, we believe that bullish positions beginning in the mid-119's could prove to be highly lucrative. Depending on the timing and the option premium available, traders may look to construct synthetic calls in which a futures contract is purchased along with a protective put. 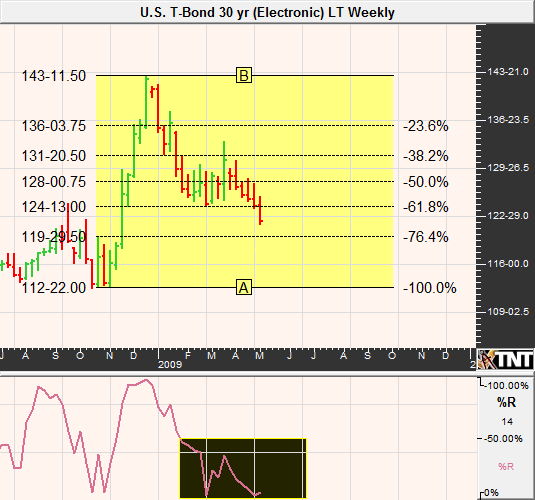 Or, it may be a good play to sell put premium against the 30-year bond should futures trade under 119. With that said, we may be looking for a short-term trade in the coming days that involves short bond puts without a full retracement to 119 (note Fibonacci support near 120). The equity market's new found optimism has made its way back into commodities. Similar to the minute reaction to swine flu on Wall Street, grain traders in Chicago were able to move beyond the threat and focus on the positive signs of recovery. Additionally, the markets were able to look past the 1st quarter GDP reading of negative 6.1 and renewed capitalization fears of two major U.S. financial firms. With all of these glimpses of hope, many are expecting the commodity markets to continue to look to equities as a guide. Currently on the side burner, but not without its influences over commodity prices, fluctuations in the U.S. greenback could come back into the limelight as the economy continues to stabilize. Unfortunately, with the Dollar waffling in a relatively tight range it is difficult to make intermediate term predictions in terms of direction. Perhaps this is why grain traders have moved to other market drivers for help. On April 27th, the outbreak of swine flu in Mexico became an international health emergency. The result was a sizable overnight retrenchment in corn prices, but by the end of the day session the market had recouped much of the losses. Subsequently, corn futures rallied above its 125-day moving average and on May 1st managed to close at the highest level in three weeks. This is impressive given the events on the 27th and the realities of a stabilized but still weak economy. Helping to keep a floor under corn prices, the USDA reduced its estimates of the 2008/2009 U.S. ending stocks from 1.74 to 1.70 billion bushels. With that said, the recent economic turmoil sent corn prices lower than many analysts could have predicted based on supply/demand fundamentals and has perhaps made future fundamental price movements nearly impossible to gauge; leaving traders with technical analysis to rely on. 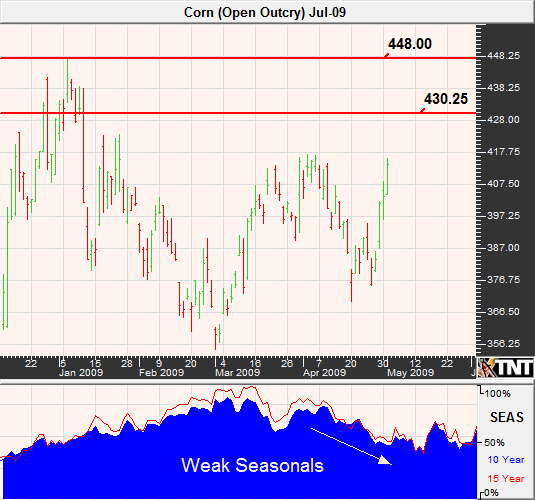 In the last newsletter, we predicted that July corn would see $4.40 and it looks like we were a bit premature with our call. Nonetheless, after experiencing a moderate pullback it looks as though we may see similar levels in the near future assuming that the greenback doesn't stage a sharp rally. However, don't forget that on a historical basis $4 corn is still pricy and aside from the occasional weather spike, grain prices struggle during this time of year. We like the idea of playing this market from the short side should the $4.30's be reached. 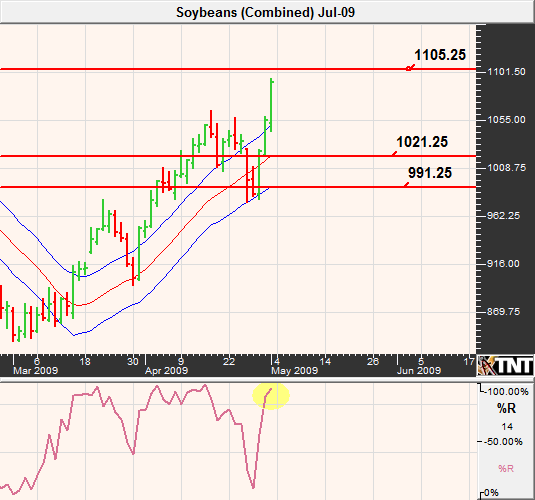 Based on Friday's close, soybeans are trading at their highest levels in seven months. In line with many other commodities, soybeans were sharply lower on news of the swine flu outbreak but quickly recovered and haven't looked back since. Along with what is being speculated as an economic recovery, bean prices were helped by a USDA reduced estimate of the 2008/2009 ending stocks to the tune of 20 million bushels. Stocks are expected to be near 165 million, down from 205 million the year before leaving the supply side of the equation somewhat tight. In addition, exports have been outpacing USDA expectations. Despite the positive fundamentals, we wonder if all of this isn't already "baked into the cake". Last month we were looking for the rally to extend slightly beyond $10.55 and we now know that the market was able to achieve even more aggressive gains. However, we see strong technical resistance near $11.05 and feel as though fundamental news will have a tough time keeping up with the rally. 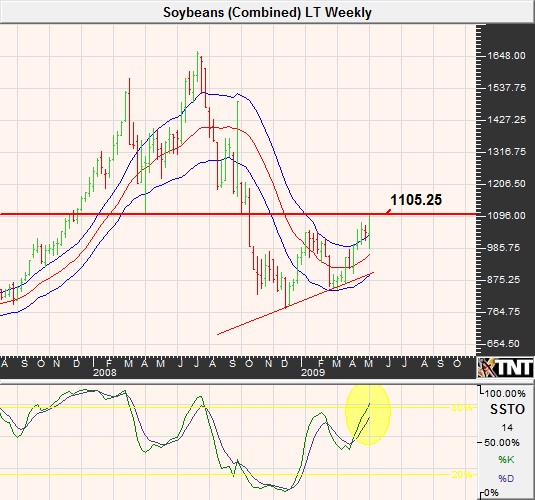 Look for a pullback in July beans to $10.20 and possibly slightly beneath $10. The month of April is normally an extraordinarily bullish time of year for petroleum products; however, this year has proven to be an exception. The most recent month was consumed by relatively violent, but in the end directionless, trade. According to the Commodity Trader's Almanac, any bullish crude positions are recommended to be liquidated by mid May. 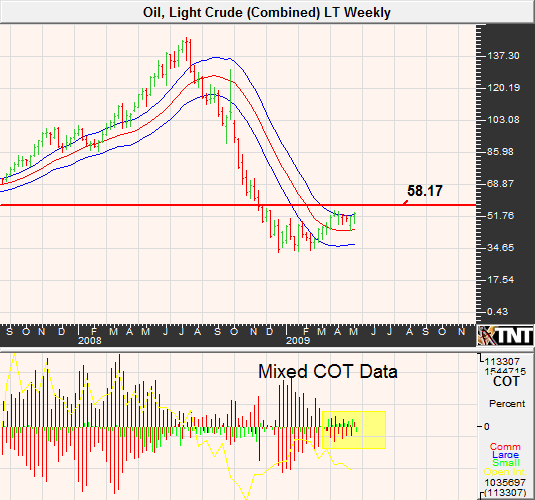 Crude oil has relentlessly avoided a significant comeback despite efforts from OPEC to cut production. This has also been one of the few commodity markets that hasn't participated in the economic recovery rally along with equities. It is uncertain whether we will see some type of late reaction to already known events or if this market has seen the highs for now. If energy prices are going to make progress on the upside, the bulk of the price increase will need to take place in the coming two weeks. Last month we thought that, with the help of a weaker dollar, crude could trade in the high $50's. As it turns out, we were wrong about the dollar and therefore May crude prices peaked out in the mid-$50's. June crude, on the other hand, appears to be ready for a push to the $58 area at which point we can't help but feeling at bearish. 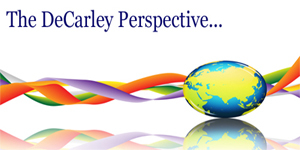 In the last newsletter, we commented on the overwhelming safe haven euphoria over gold and silver and noted that this is typically a sign of the end of a bull run. Based on weakness experienced in April, this was a realistic projection. 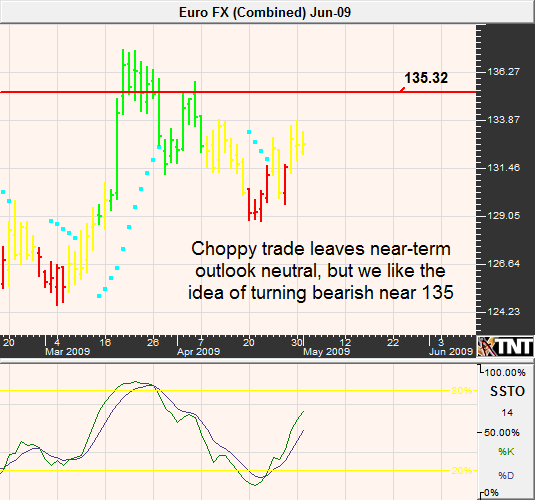 The tendency for metals to trade weaker in the spring normally carries itself into the early summer months. Therefore, we don't expect that gold or silver will be able to make significant price gains in the absence of another bout of economic panic. Inflation remains a wild card for the metals as traders are still mulling over which is factor is more prominent in determining metals valuation, potential inflation (bullish) or potential economic stability (bearish). As of now, inflation has not been a contender. Nonetheless, based on basic economic theory that suggests the government policy of expanding the balance sheet (printing money) is inflationary and will eventually catch up with the markets. The question is: when will it happen and will the Fed be effective in combating it once things begin to heat up? In the last newsletter, we were cautiously calling for gold to trade in the $880's and silver to see $12 and have subsequently witnessed trade not far off the mark. This time around, we are still looking for lower prices. 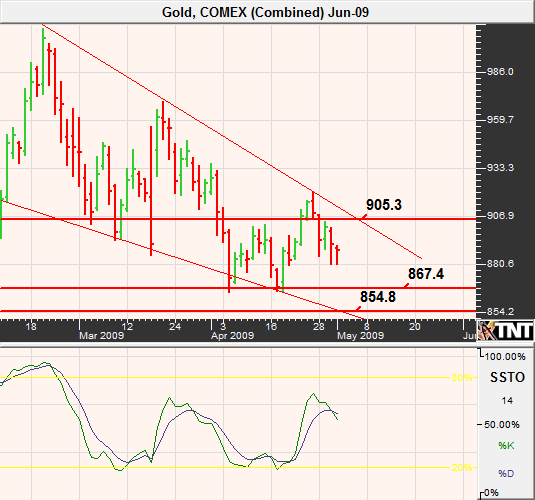 Look for near-term resistance in June gold near the $900 mark and support at $867, although we think that a move to $854 is in the cards. Based on intermediate term analysis, it seems as though a move to $770 isn't out of the question at some point in the coming months. The U.S. dollar has recovered from the walloping blow provided last month by the Fed's pledge to purchase its own fixed income securities. As mentioned in the Treasury section, the Fed seems to have exaggerated their role (or intentions) and it didn't take long for the market to compensate. We are a little surprised by the resiliency of the greenback. Our original projection was for the dollar index to trade near 81 before finding buyers. However, the index has found a considerable amount of support near 84 and seems to be content in doing so. As has been the case for several months, the struggling U.S. economy has been in a "less worse" position relative to that of many of the other major currencies. Therefore, traders and investors have found that U.S. backed securities (dollar denominated assets) are attractive when compared to the alternatives. This phenomenon has stabilized the domestic currency and likely added to the health of the U.S. stock and bond markets. 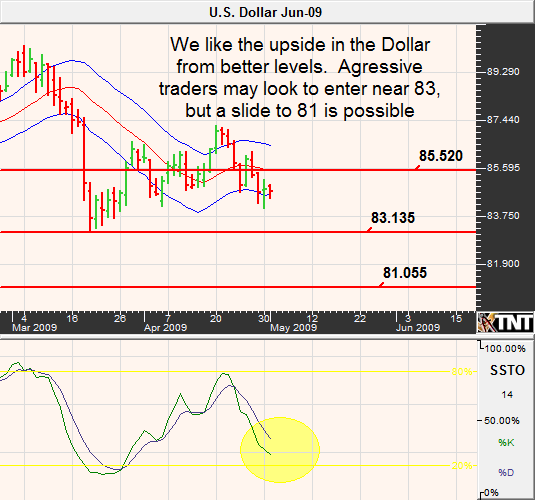 As long as the dollar index hold below 85.50, there is risk of a moderate slide to 83 and possibly even our 81 target. With that said, we lean toward buying breaks at noted levels in this market. With European economic data in the less than impressive category, we expect that any technical momentum witnessed in the currency will fail to maintain gains. The unemployment rate in the EU is is near 9% and the IMF (International Monetary Fund) is predicting that the real GDP will be down 4.2% in 2009 and down .4% in 2010. Don't forget that in the three largest components of the EU, Germany, France and Italy, the governments consume approximately 50% of their nations incomes. This should prevent a sharp recovery in this area of the world. Until Friday's remarkable rally, sugar prices had been consistently range bound between approximately 12 and 14 cents. In fact, this had been the case for so long that there were a considerable amount of buy stops lurking above 14 cents. On Friday, traders were reminded of the fury that can occur following a period of quiet trade and the election of lingering stop orders. Many are expecting that ethanol export demand from Brazil will see a gradual increase and therefore leave sugar prices with an overall bullish posturing. This is despite the fact that Brazil is expecting a large cane crop this season and the expectations for somewhat lower world demand in light of the sluggish global economy. Nonetheless, these market fundamentals are well known and we believe built into pricing. We prefer to focus on the technical set-up as well as seasonal tendencies. Friday's blow out rally has likely flushed many of the sugar bears out of the market via buy stop election and voluntary liquidation. This should pave the way for eventually higher prices but near-term trade is susceptible to a correction. After all, we have come a little too far too fast and the market normally sees early May weakness before gearing up for a summer rally. 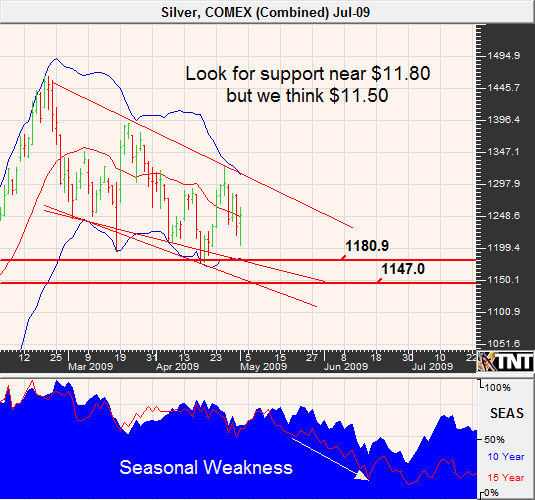 Look for July sugar to trade closer to 14 cents once again with a possible move to 13.66. We may have been amiss on many of our calls in the previous DeCarley Perspective, but that can't be said of our expectations in coffee. Last month, we were anticipating a continuation of the rally to $1.20 and a subsequent move lower to $1.10 in the May contract. This month it seems as though the path of least resistance may be slightly higher in the near-term but this market normally sees a significant top by May 22. This is because the market builds in a risk premium for a potential freeze in South America that would threaten coffee supplies. More often than not, the freeze season comes and goes without incidence and sends coffee prices lower. We are looking for a possible move to $1.22, and maybe even the mid-to-high 126's on weather fears, in the near-term but believe that such levels will be a great opportunities for the bears. Hog prices suffered the brunt of the swine flu panic as the realization of the threat on April 27th caused a dramatic plunge in prices. Although swing flu can't be spread by eating pork, even improperly cooked port, but it will likely take some time for this market to begin thinking rationally again. On the day of the announcement, hog futures traded at or near locked limit for a majority of the day and the next three trading sessions weren't much better. In the previous newsletter, we mentioned that hog prices would have trouble forging gains and mentioned that they become an attractive buy in the mid-to low 60's. While we had no way of predicting the manor or reasoning behind the plunge, it seems as though our instincts in this market were somewhat correct. The June contract settled on May 1st at 65.575 and we are looking for a bounce to fill the gap left on April 27th following the swine flu announcement. Cattle futures were also unfairly affected by the swine flu fiasco. Additionally, the market spend the majority of late 2008 and early 2009 accounting for the new economic fundamentals, AKA globally sluggish demand. In other words, it seems as though a majority of the weakness factors are built into pricing and in light of continued economic stability we should see a move higher in live cattle futures. Last month we pointed out a seasonal downturn during the month of April and this time around we are going to point out the opposite. Cattle prices tend to benefit from seasonal tendencies rather dramatically in the month of May. Also, our prediction in the previous newsletter for a move lower to 80.50 and a subsequent rally seems to have paid off and gives us confidence in the technical trading range. 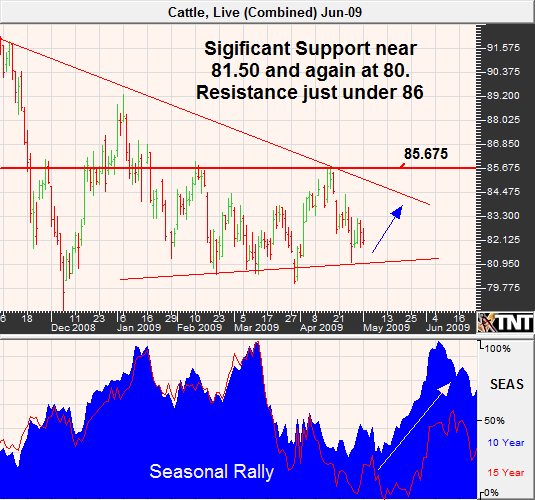 Therefore, we are looking for a rally in June cattle to the mid 80's and a break above this level could pave the way for 89.